The boys are back! 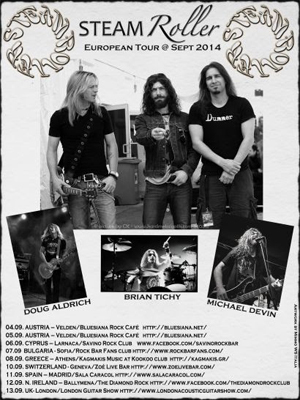 Guitarist Doug Aldrich, with bassist-vocalist Michael Devin and drummer Brian Tichy, return as the original STEAMROLLER. STEAMROLLER - featuring past and present members of WHITESNAKE, DIO, BILLY IDOL and FOREIGNER - will take their jam band on the road in Europe for another short but intense tour. Marshall Amplification invited them to play at London Guitar Show, a great way to end a tour. The guys first performed a series of interactive clinic-concerts for Marshall Amplification in the UK in late 2011. Gaining confidence on tour, their trial-by-fire was playing two shows back to back at Frankfurt Music Fair early 2012 in front of crowds of +5000 music industry professionals. Since then they have SteamRolled across Europe in 2012 and 2013 and are set for a third round soon.